WordPress tells me via a Congrats email with some sweet graphics and a bill for web hosting that embracethefunk.com is 4 years old. 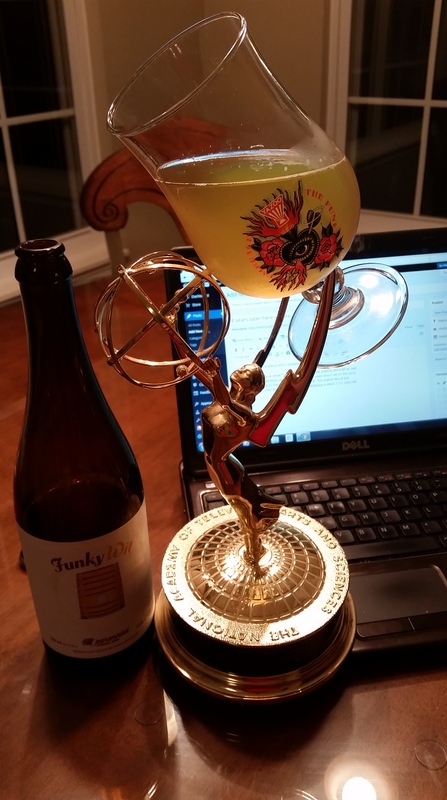 I’m reflecting on my time as a television director moving entirely into brewing and lucky enough to have an unusual glass holder. Wow 4 years since I was sitting on the couch and my wife urged me to start a blog on sour/funky beer. The original idea of just keeping up with my own thoughts and records on homebrews is 4 years old,but ETF took off about 3 1/2 years ago. Why the time difference? Well this blog really took off when I posted an a quick Q and A with 2 of my mentors Vinnie Cilurzo of Russian River and Jean Van Roy of Cantillon . I sit here and wonder why did those two world class 100 point brewer style masters even bother to talk to me back then? I sorta kinda minus 10 knew Vinnie through a generous donation he did of an empty barrel of Consecration Batch 1 to myself and some other local homebrewers years before, plus a some questions on sour brewing I had. For the Cantillon part, again I had emailed JVR a few questions in past. really basic questions, but he was always kind enough to answer me back. But for whatever reason I these were the 2 guys I decided to ask some more of…and they delivered awesome bits of info not revealed anywhere else. I could never give enough thanks to either of those gentleman for what their few minutes of reply did for this site and my life and years later leading me to this point of running a sour/wild program with my friend Linus Hall at Yazoo Brewing Company and walking across the stage at GABF. Back to the title of the post. 4 years later and here we are…what have I learned? Is this all inclusive? Nope. Just some things on my mind in absolutely no particular order except #1. Make sure the stars are what you aim for, you will make mistakes, don’t worry its journey…enjoy the ride. Put your pride to the side, don’t sell it or serve it to your friends if you wouldn’t enjoy multiple glasses. EVERY BREWER WORTH A FLIP WILL TELL YOU THEY DUMP BARRELS AND PULL BARRELS OUT OF COMMISSION THAT DIDN’T TURN OUT. Stop trying to step up bottle dregs from the awesome .rar brewery of the month or old Lambic producer for a 500 gallon batch. Most got their microbes from Wyeast, White Labs, ECY, Omega, RVA etc… Talk to the lab about your recipe and buy a healthy solid pitch. I assure you they want you to make great beer. Use lager or hybrid pitching rates when brewing 100% Brett beers. Kettle Souring and Natural Souring can both make yummy beers. We get it already on both sides of the argument already. Neither are the absolute way. They are simply techniques brewers can use in their settings. After all these years Brettanomyces only still doesn’t produce what a lot of consumers/rating bros consider a “sour”beer to be. HELP THEM UNDERSTAND WHAT BACTERIA VS WILD YEAST IS ALL ABOUT. Treat everyone like they traveled 1,000 miles to taste your one beer, because sometimes they actually did. You must have a way to test gravity AND pH (or TA if you are feeling adventurous). Your barrel aged beer will take more time than you expected. Make friends with your local or regional winery/distiller. Most likely a lot of people buy their products so some familiarity in character will go a long way in introducing your funky beer. If you can’t do the above then find a reputable barrel broker. Ask a few of your favorite brewers who they use, some will tell you some won’t. But that one answer will mean all the difference. If you are building a barrel facility then invest in good sloped drainage AND a good mop/bucket/stereo. Use 17% more Co2 to purge than you think is necessary ( this number may or may not be exact, point is when dealing with sour beer don’t skimp on co2). Error on the side of less than what you expected when dealing with new microbes. Most will continue to develop into something more. Its OK to take your time. Investigate and Employ techniques that make the best beer possible in your garage, kitchen, patio or brewery. Don’t just simply buy into one thing fits all. I assure you techniques that work at one world class brewery do not directly translate to another world class brewery. However…take some calculated risks…or don’t.